With the help of an expert guide you can enjoy the Catalan countryside like few people ever get to. Narrow wooded paths, slopes and cliffs are just some of what is waiting for you. Remote villages, nature, local cuisine and adrenaline! 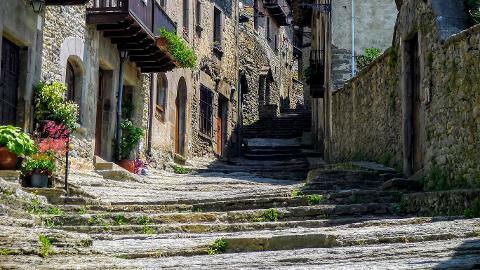 Some of the medieval villages in the Pyrenees are remarkably well preserved, and they await you just a stone´s throw away from Barcelona. After leaving Barcelona we will head towards the Collsecabra mountain range, characterized by splendid cliffs, impressive forests and the occasional isolated farm. We will visit the ancient village of Rupit and go back in time –walking along the winding cobbled streets among buildings 500 years old, finding never-to-be repeated opportunities for photography and human encounters at every corner due to this village´s authenticity. The daily life of the inhabitants continues undisturbed around the few visitors. Despite the fact that this village has been continuously inhabited to this day, this is not where you would find the large number of tourists that crowd the streets of Barcelona. After a break for coffee and local pastries we will set out on foot for an easy trek in the forest with its breathtaking scenery, reaching an observation point over an impressive waterfall and the cliffs surrounding the village. Traditional Catalan food is served throughout the village and can be enjoyed after the short walk. Additionaly there is the option of adding some excitment to the tour by selecting one of our extra activities that are offered in the area - Kayaking, offroad segways and more.